Fox's Pizza Den franchise business opportunity. 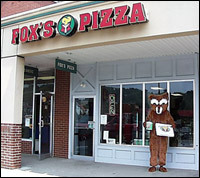 Free Fox's Pizza Den business franchise information. For 35 years, Fox's Pizza Den has been committed to delivering the knowledge and understanding that gives our franchises a better chance to succeed. Our operation is simple. We provide you with guidelines for success and profitability and help you gain your independence for very little money. Our low franchisee fee of $8,000 and flat $200 a month royalty makes owning a business accessible to people of average means, while enabling them to keep a greater percentage of the profits. Most other franchises charge a percentage of gross sales as their royalty fees. This penalized the aggressive, go-getter franchisees because the more business they do, the more they must pay the franchiser. At Fox's the more business you do, the more money you make. Why choose the pizza business over another franchise business? It has been estimated that 94% of the United States population eat pizza at a rate of 100 acres a day. As the demand for pizza, sandwiches and home deliver continues to grow, so does the market. The pizza industry generally involves a low investment, high percentage bottom-line, weekly inventory turnover, a small number of employees and very little bookwork and accounting, making it one of the easiest businesses to own. I'm interested in becoming a Fox's Pizza Den owner. Fox’s Pizza Den currently offers U.S. franchises only - throughout the United States in all areas except California. To learn more about the Fox's Pizza Den franchise opportunity, simply complete the form below.